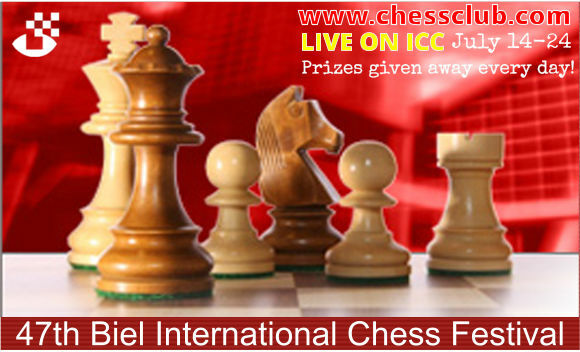 Biel, ICC and New in Chess! The 47th Biel Grandmaster tournament - in memorian Hans Suri - starts tomorrow, with an interesting line-up: GM Maxime Vachier-Lagrave, the strong #1 French player who, despite his young age, is to be considered an expert GM, as he got the title when he was 14; the 20-year old Russian-Dutch GM Anish Giri; Pentala Harikrishna from India, where he is number two (guess behind whom? ); Polish GM and second to Anand in several occasions Radoslav Wojtaszek; GM Alexander Motylev from Russia and the Women World Champion Hou Yifan, from China. The tournament is a 10 rounds double roun d robin. Games start at 8:00 a.m. EDT (ICC time). ICC will relay the games LIVE. During the games, starting one hour into the round, and then at the top of the two following hours, there will be TRIVIA! ICC members can win FREE months, and the third TRIVIA contest for each round will allow an ICC member to win a one-year subscription to New in Chess DIGITAL! It is the digital version of the New in Chess magazine, therefore the winner will be able to enjoy it on an iPad or an Android tablet.